The GPO, Mount Street Bridge, The South Dublin Union -- these are names that resonate when it comes to Easter 1916 as the battlegrounds for what became Padraig Pearse’s ‘glorious failure.’ However, for some quirk of history, the success that took place in the sleepy town of Ashbourne, County Meath, during the Rising has been largely ignored by the general public. On April 24, Easter Monday morning, Commandant Thomas Ashe (right) received orders from James Connolly to send 40 of his 5th Fingal Battalion to the General Post Office, in Dublin, to help fortify it. Also contained in his orders were instructions for Ashe to raid nearby barracks, thereby, hopefully, locking down Crown forces and relieving pressure on those fighting in the city. Ashe sent 20 men to the rebels’ headquarters at the GPO and kept the remainder for the barracks attacks. It would prove to be a wise decision by the school teacher from Lusk. He retained 60 men and seized the Royal Irish Constabulary (RIC) barracks and the Post Office in Swords. They would have further success over the next few days, seizing barracks and Post Offices in the nearby villages of Donabate and Garristown. The rebels then turned their sights on Ashbourne and planned to attack the RIC barracks there. That day, Ashe was joined by Richard Mulcahy, who had only recently been appointed to the rank of First Lieutenant. He was in the area following his own orders and happened to meet the Fingal commandant by chance. Ashe immediately made Mulcahy his second-in-command. Before launching their assault, the rebels had made sure to cut telephone wires, and even sawed down telephone poles, to block off communications with the surrounding police district. Ashe also decided to send his older volunteers home, thus reducing his ranks to about 45 men. The attack at Ashbourne would prove to be tougher than the rebels had expected. Usually, the barracks was manned by a sergeant and four constables, but it had been reinforced due to the fighting in the capital. Instead of five RIC for the rebels to contend with, there were now 10 policemen, led by a District Inspector McCormack, all well-armed and well-prepared. The rebels had an early boost when they managed to disarm two RIC men who were setting up a barricade outside the barracks. Ashe then called on the remaining officers to surrender. Instead, the RIC showed the rebels the business end of their guns, and soon heavy fire was being exchanged. The rebels were making little headway until a homemade hand grenade was lobbed at the station. This soon settled things and the RIC inside waved a flag of surrender. However, just as the constables were about to emerge, the rebels were alerted to the imminent arrival of a large RIC convoy, under County Inspector Alexander Gray, on its way to put the down the rising. With the prospect of rescue from the convoy, the besieged policemen returned to their posts and resumed the fight. Seventeen cars carrying approximately 60 RIC officers from Slane were, at that moment, speeding toward the rebels. Ashe and his men were in a race against time, and had to rush toward the road to stop the convoy reaching the crossroad at Rath Cross, where the RIC could then spread out. It was at this point that second-in-command Richard Mulcahy (right) came into his own. The narrow Dublin to Slane road, with its tall, close hedges – about seven-feet-high – on either side, provided perfect terrain for the rebels. Mulcahy had his men positioned on both sides of the road as the convoy approached at a few minutes past noon. Just before Rath Cross, the road rose at Hammandstown. It was just as the convoy crested this hill, 15 yards from the crossroads, that the rebels launched a devastating attack on the Crown forces, with the RIC taking heavy fire from all quarters. First to be hit was County Inspector Gray, in the lead car. The rest of the convoy then jumped from their vehicles, seeking cover behind the wheels or beneath the cars themselves. Others leapt into a ditch and started firing on their attackers from there. The fighting was fierce. A civilian car that blundered into the ambush was also fired on, resulting in the deaths of two of the occupants. For five hours lead flew in all directions. The rebels were closing in. The convoy’s new commander, District Inspector Harry Smyth, managed to kill one volunteer with his pistol only to be shot dead himself a moment later, his brains spattered across the ditch into which he fell. With the loss of their leader, the police signaled their surrender. At the end of the carnage, eight policemen lay dead in ditches and along the road, and up to 18 were wounded. The rebels suffered two dead – John Crennigan and Thomas Rafferty – and five wounded. The besieged officers in Ashbourne barracks soon gave up the fight when they were informed that the rescue party had been defeated. Ashe and Mulcahy had the injured, including the RIC, ferried to the Meath Infirmary, in Navan. Singing in chorus and cheering for the Irish Republic, Ashe’s men marched off and camped at Kilsallaghan, near Dublin, where they remained until they received orders to surrender on Saturday. The statistics speak for themselves – four barracks raided, eight RIC killed, 18 wounded, up to 80 policemen captured in total; all this with the loss of two dead and five wounded on the rebel side. If a lesson in guerrilla warfare was ever needed, all any future rebels had to do was to compare the results from the fighting in Dublin to that of the men led by Thomas Ashe and Richard Mulcahy in Ashbourne. Thomas Ashe would have his death sentence commuted for his part in the Rising, but he would die nonetheless a year later in Mountjoy Prison, while being force fed when he was on hunger strike. Richard Mulcahy would go on to have a stellar career as Chief of Staff of the Irish Volunteers, Commander in Chief of the Free State Army, and Minister for Defence in the Civil War, as well as holding other ministries in the years following. Paul O’Brien’s book Field of Fire – The Battle of Ashbourne, 1916 offers an intense look at those four hours of combat. I showed it to an old friend of mine, Charlie Weston, who lives in the area where the fighting occurred. It turns out that his grandfather, also named Charlie Weston, was one of the section leaders during the attack. My friend spoke with real pride for what his grandfather had achieved on that day. The Battle of Ashbourne was important because it showed that Crown forces could be comprehensively defeated if the right tactics were chosen. Never again would Volunteers make prisoners of themselves by occupying buildings that could then be surrounded by the British military. Instead, the use of ambushes and guerrilla tactics would be critical to the success that would follow in the War of Independence. The brave men at Ashbourne paved the way for that kind of warfare – the only kind that could possibly defeat the might of the British Empire. It’s just a pity their courage and fighting prowess is not as widely acknowledged today as it undoubtedly should. Thank you for sharing, have never heard of this battle. He gave me a signed copy of - A Terrible Beauty - writing about it , does not do justice to these brave men , who gave their all for Irish Freedom ....... That is my claim to fame !!! I'd like to have been a fly on the wall during that chat in Kilcoole.Fascinating subject matter. You could have come up from Greystones for a cup of tea !!! Ashe has a famous American cousin: Gregory Peck. The funeral of Thomas Ashe. Yes, somebody only told me that the other day. Isn't it gas?! Check out this photo. 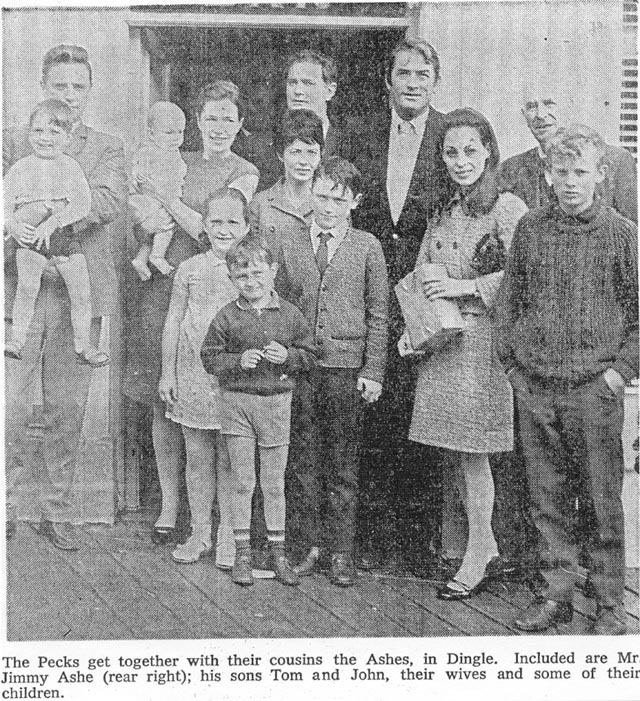 The Peck's with their Ashe cousins in Dingle in 1968.